Narex 88900 Monster Hand Cut Stitched 13-1/2'' Cabinet Maker's Rasp Coarse Cut 19'' Overall European Hornbeam Handle by Narex at N Online Agency. MPN: 872531. Hurry! Limited time offer. Offer valid only while supplies last. ''This hand cut rasp is made by Narex Bystrice of the Czech Republic who has been in the business of making premium edge tools for near a century. 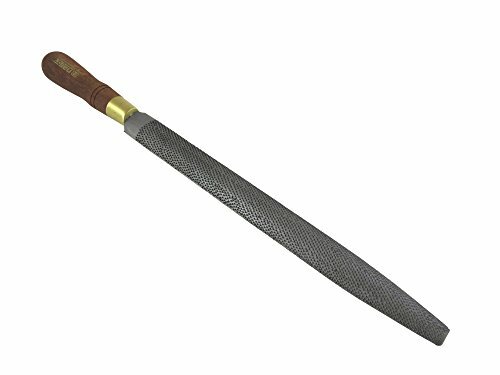 "This hand cut rasp is made by Narex Bystrice of the Czech Republic who has been in the business of making premium edge tools for near a century. Cabinet maker's rasps are generally used for shaping work and can remove a lot of material and leave a smooth surface. The rasp blank is forged and then carefully ground to final shape. The teeth are carefully stitched by hand to a uniform height, but with a slightly irregular pattern. This allows the rasp to cut quickly yet leave an even surface with no scratch pattern. Blades are stitched right to the edge to allow working in tight corners. This rasp will work equally well with both right and left handers. Blade is 13-1/2" long. In cross-section, the blade is curved on the top and flat on the back. Handle is 5-1/2" x 1-3/8" round made from dense European Hornbeam. Overall length is 19". Blade is 1-1/4" at its widest and tapers to 5/8". Tooth pattern is considered coarse with 10 teeth per square centimeter or 64 per square inch. This is a great value for a well-made hand-cut rasp. " Made by Narex Bystrice of the Czech Republic who has been in the business of making premium edge tools for near a century. Works equally well with both right and left handers. Blade is 13-1/2" long, with a 5-1/2" x 1-3/8" round European Hornbeam handle. Overall length is 19". If you have any questions about this product by Narex, contact us by completing and submitting the form below. If you are looking for a specif part number, please include it with your message.